1) Gave a "dry run" presentation on Wednesday for the "This is Your Ancestry, Greg Cox" talk to be given at the Chula Vista Family History Day on 29 September. Committee members offered suggestions - best one was "remind the audience how those ancestors are related to the subject." Also figured out the staging and microphone usage. 2) Worked on the Greg Cox RootsMagic family tree during the week, which now has 597 persons with 1,856 citations. I TreeShared it once, and resolved all of the Ancestry Hints. Almost done, I think! 3) Moderated the SDGS RootsMagic Users Group at the Allied Gardens FHC on Saturday morning. We had 12 attendees. I tried to answer questions, and Larry K. discussed his discussion with Bruce Buzbee at FGS. 4) Attended the SDGS DNA Group hosted by Colin Whitney on Saturday afternoon. There were about 20 attendees. Colin described in some detail the intricacies of FamilyTreeDNA and 23andMe, with comments and experience from the attendees. 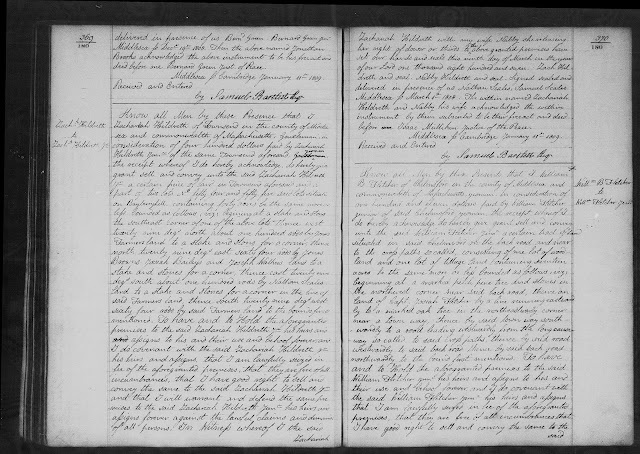 5) Searched for and found land records for several Zachariah Hildreths in Townsend, Mass. on FamilySearch. 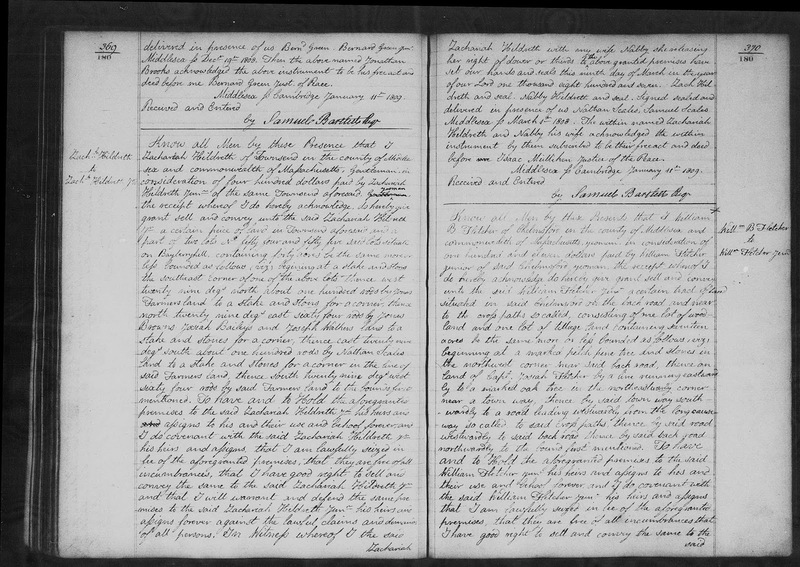 Transcribed one of them in Amanuensis Monday - 1807 Deed of Zachariah Hildreth to Zachariah Hildreth Jr. in Townsend, Mass. today. 6) Participated in today's Mondays With Myrt webinar, and discussed my blog post 52 Ancestors - Week 244: #369 Deliverance (--?--) Oatley (1700-1733) of Washington County, Rhode Island. We also discussed the PeopleLegacy.com scraping, Hamburg death certificates, online trees, research perfection, DNA events in software and trees, WikiTree source-a-thon, and Bernice Bennett's trip to Africa. 7) Watched the "25 Simple Research Hacks Every Genealogist Should Know" webinar by Lisa Alzo on Family Tree Webinars. 8) There were several sessions working in RootsMagic to update FamilySearch Family Tree profiles for Seaver families and other database families, with occasional additions to the RootsMagic profiles. I have matched 26,205 of my persons with FSFT. I continue to use Web Hints from Ancestry, MyHeritage, Findmypast and FamilySearch to add content and sources to my RootsMagic profiles. I now have 50,845 persons in my RootsMagic file, and 96,144 source citations. 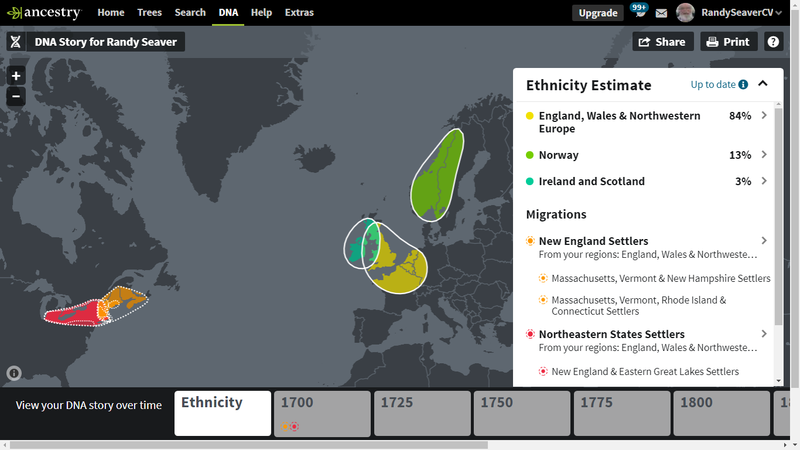 I TreeShared twice during the last week, and resolved over 800 Ancestry Hints. I've fallen behind on the Ancestry Record Hints with 76,960 waiting to be resolved, but I work on them occasionally. 9) Have 307 Shared Ancestors on my AncestryDNA list (I had 307 last week), 983 4th cousins or closer (I had 981 last week), and 895 pages (over 44,700 matches with at least 6 cM) (was 890 pages last week) of matches. I have 23 DNA Circles (was 23 last week). I have 16 matches that are third cousins or closer (was 16 last week), and 103 matches with 34 cM (0.5%) or more (was 103 last week). My highest match has 779 cM (11.5%), and is one of my first cousins. Installed the BetterMed DNA Chrome extension, and standardized notes for about 40 of the top matches. 10) Have 4,609 DNA Matches on MyHeritage (up from 4,534 last week) with at least 8 cM (0.12%), with 28 matches with more than 34 cM (0.5%) or more (was 27 last week). I have three close relatives, including a first cousin once removed, and two first cousins twice removed. The highest DNA match is 512 cM (7.1%). 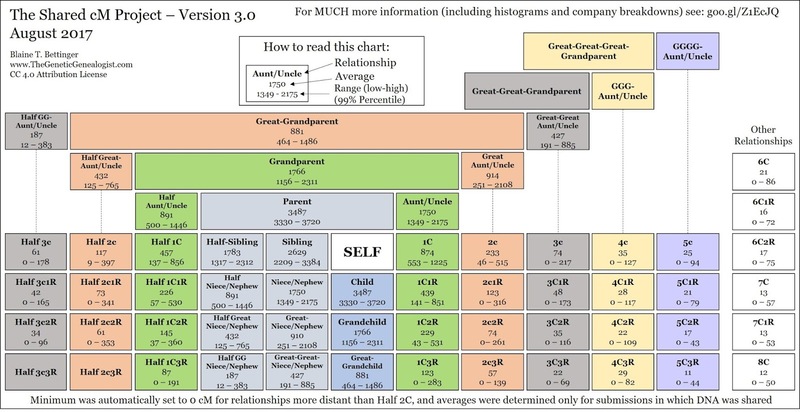 11) Have 989 DNA Relatives on 23andMe (I had 990 last week) who share at least 0.10% (7 cM) with me. The two closest relatives are third cousins. Of these, only 3 share 1.0% or more, and 49 share 0.50% or more (was 48 last week), with the highest match being 1.54%. My highest match is an adoptee. I struggle to find out anything about most of these testers. 12) Have 2,795 autosomal DNA Matches on FamilyTreeDNA (up from 2,781 last week) who share 0.25% (18 cM) or more, with the highest match being 96 cM (1.42%). I have 12 who share at least 1.0% (68 cM) with me, and 1,506 who share at least 0.50% (34 cM) or more (was 1,499 last week) with me. 13) Wrote 18 Genea-Musings blog posts last week, of which three were press releases. The most popular post last week was "PeopleLegacy.com Blatantly Copies Most of the FindAGrave.com Content" with over 443 views.